University Hospitals Bristol Trust (UHBT) is proposing to build a multi-storey car park (MSCP) at the bottom of Marlborough Hill. To make space for this, it would demolish the 3 blocks of 36 flats located on Eugene Street. It would also demolish its existing 250-place multi-storey car park opposite the flats. 1) If the UHBT MSCP goes ahead, 36 homes would be demolished, which otherwise could be occupied by by UHBT key workers. 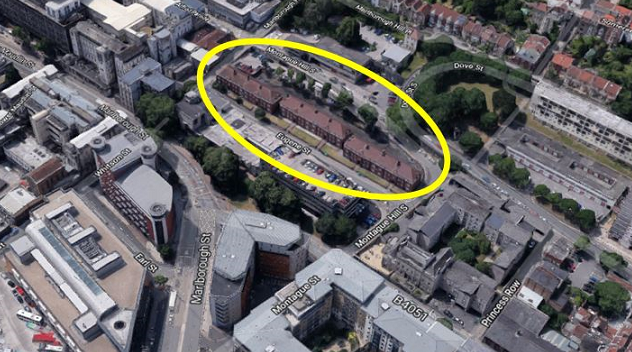 2) The proposed MSCP is enormous (8 storeys tall), hence would have an adverse impact on Kingsdown. 3) There is the issue of air pollution. This is already one of the most polluted parts of Bristol (greatly exceeding EU guidelines). Placing a MSCP here will not improve the situation. a) Most patients from outside of Bristol could use 1 of the existing Park & Ride car parks, if the HUBS buses were better coordinated. The Metro bus has yet to start operating. Clearly, this would be a far cheaper and less disruptive solution. b) It would help enormously if more buses stopped on Upper Maudlin Street, in front of the BRI. UHBT personnel should liaise with First Bus, to make this happen. That is appalling, for all the reasons stated above, also those houses are lovely houses or have the potential to be lovely houses, if money was spent on them. 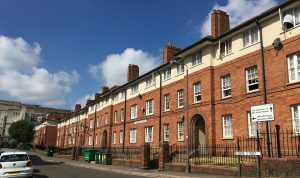 Housing is Key, not cars! In the light of childrens’ deaths being definitively linked to air pollution, it is completely contrary to the way we should be going. We should be working to decrease the toxicity in city centres. A tree-filled park for patients to enjoy would be more in keeping with the policy of air health. The issue of patients’ access has to be solved some other way, not by tightening the screw of overuse and pollution of one small area. Many more hospital buses from park and rides? A friend of mine clearly remembers UBHT approaching the council for the land, which was handed over subject to UBHT NOT knocking down the flats. Should be in the council minutes? This is so backward looking! We need solutions for the future not replacing much needed housing with a car park that will exacerbate our air pollution and traffic crisis. I’m very keen to campaign against this – anyone know of anything organised apart from the very useful information above? UHB has been very cynical in this whole matter, even the phrase “transport hub” is pure cynicism. The plan all along has been to let the building fall into ruin over time and use the old abandoned unfit housing ploy to enable them to demolish the building for a car park. 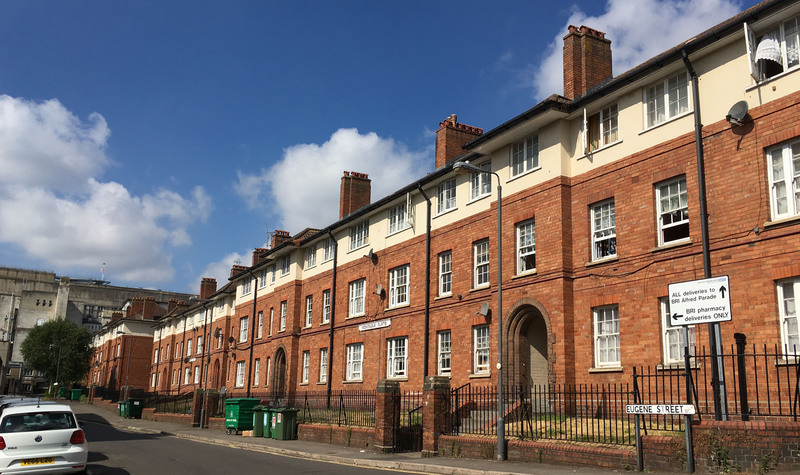 The housing crisis in Bristol is a disaster, the hospitals will not be able to find the workers if it can’t welcome them to the city and provide temporary / semi-permanent accommodation while people settle and look for somewhere permanent. Everyone in Bristol will suffer as a result of this. The pollution caused by the cars and the traffic it will generate on Malborough hill and surrounding narrow roads will be a disaster. Back to back traffic, it’s already terrible around there as it is.